This program is based on a bestseller by the experienced coach Sergey Ivashchenko. 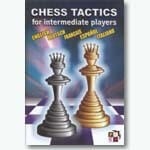 It is a sequel to the popular program Chess Tactics for Beginners. It is a Windows-based chess tactics testing and training program intended for intermediate players. Topics include: Mating combinations, Pinning combinations, Decoying, Blockade, Exchange, etc. The program is designed for chess players with the ELO level of 1600-2200. The exercises are arranged in 19 sections according to increasing difficulty. All the sections contain exercises for Practice and Testing. After you have solved a problem, you are given an ELO rating. This rating is based on the difficulty of the problem, the time taken, and errors if any you made. Your original rating is adjusted up or down after each exercise. The program includes positions from practical games, endgame studies as well as training examples.